Rainy and a drab autumn weather here in New York after the day of the election. Walking down in the Fifth Avenue at the 55th Street, to grab lunch, I noticed many cars crawling at snail’s pace in the traffic jam. Many people flocking in the streets with cameras taking pictures of the Trump Tower. There is too much energy around here in New York, everyone is mouthing opinions and engaging in animated banter. I was thinking and then a smile came up from within me and reflected on my face. “I am a joy-maker!” I said. I am making something which will bring a hope and a smile in the lives of people who are caught up in life, tossed at work, impelled by relationship dramas, hurled by the political dynamism and are stuck in the daily grill. For past two decades I am working in the virtual world and now I want to reach out and have a tangible presence in their daily life. He looked fascinated and then I showed him the miracle wall calendar for the coming year of 2017. He was flipping through the pages, his smile widening with every turn. 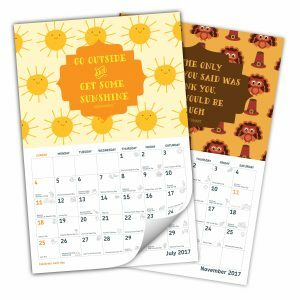 The calendar displays an array of quirky and exciting global events and holidays earmarked for each day, it gives a unique reason every day to plan something special and take out that the ‘me’ time and the ‘we’ moments. It can assist a writer to write, a marketer to set trends, an artist to create art, a student to plan an activity, a family to plan holidays or meals, a friend to find the perfect reason to reach out to others and the list is endless. He held it in his hands and looked into my eyes and exclaimed with rapture, “This is indeed what I was looking for.” I was delighted to see the excitement of the toy maker. He ordered a few copies of the calendar from 123greetings.com online store for gifting to his folks on this Thanksgiving. He said, “It is the best keepsake to give in the coming time because joy always trumps gloom.” At that moment an errant, drenched woman entered with a broken umbrella mumbling and swearing under her breath. I walked up to her with a cup of hot coffee and helped her with her jacket. She looked at me and smirked gladly. I returned to our table where the toy maker was grinning at me. “And we are the joy makers, no matter the weather,” I added. We both were probably the only two chuckling in the cafe. Give yourselves enough reason to overcome gloom and doom because joy always trumps. 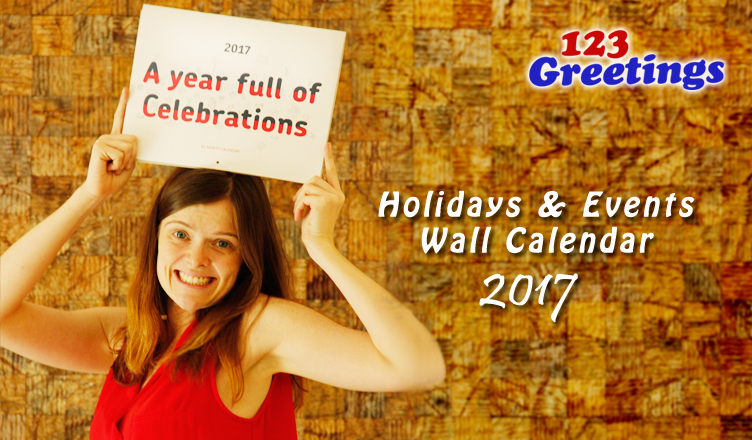 Grab a copy of the wall calendar for 2017 now and be the first to know about the global events and holidays in the world all year round. 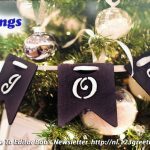 Global Events & Holidays Wall Calendar For 2017! 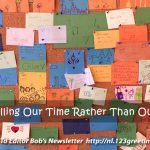 Previous Are We Filling Our Time Rather Than Our Hearts?